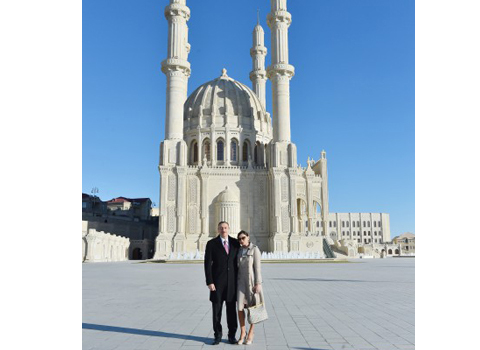 Heydar Mosque, the largest mosque in the Caucasus was opened in Baku on December 26. Azerbaijan’s President Ilham Aliyev, his spouse Mehriban Aliyeva and family members attended the ceremony. The building, which covers a total area of 12,000 square meters, was constructed under the instructions of the head of state. The mosque has four 95m-height minarets. President Aliyev repeatedly visited the construction site to review progress of activities and give relevant instructions. The mosque covers a total area of 4,200 square meters. It has 55m-height main and 35m-height second domes. The ceremony started with recitation of an ayah from the Quran. President Aliyev addressed the ceremony, and delivered his greetings on the opening of Heydar Mosque, which he described as a remarkable and historic day in the country’s life. Following, Ismayil Berdiyev, chairman of the Coordinating Council of Muslims of the North Caucasus, Mufti of Karachay-Cherkessia of the Russian Federation, Eparchy Alexande,r head of the Russian Orthodox Church’s Baku and Azerbaijan, Milikh Yevdayev, head of Baku Mountain Jews Religious Community, Shafik Pshikhachev, Plenipotentiary Representative of the Caucasian Muslims Office in the Russian Federation and Allahshukur Pashazade, chairman of the Caucasus Muslims Office Sheikhulislam made speeches. In conclusion, prayers were said for national leader Heydar Aliyev, his wife Zarifa Aliyeva and martyrs, who died for the motherland.